Brian Cox and Robin Ince ask what happened before the big bang. Brian Cox and Robin Ince transport their own take on quantum physics to Glastonbury. Brian Cox and Robin Ince explore how we measure the universe. Brian Cox and Robin Ince head to Mosi in Manchester and look at the invisible universe. Robin Ince, Brian Cox and guests debate whether Cosmology is really a science? 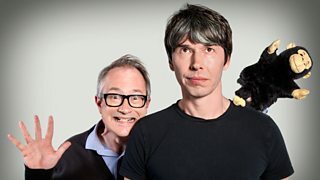 Brian Cox and Robin Ince discover how science can make the invisible visible. Brian Cox, Robin Ince and guests look at one of the most tantalising ideas of cosmology. Brian Cox and Robin Ince ask what ingredients it takes to build a universe. Brian Cox and Robin Ince take to the stage at the home of radio astronomy, Jodrell Bank. Brian Cox and Robin Ince return to discuss the next great mystery for particle physics.